Zyndranova, like other borderland villages, developed from the close relationship of varied ethnic groups. In this village lived Lemkos, Jews, and Gypsies. All of these groups contributed to the cultural face of the village. Until the Second World War, the village numbered 180 families, mostly Lemkos - an ethnographic group whose origin is still debated by scholars. Lemkos, a shepherding-farming people remarkably adapted to the conducting of agriculture on the difficult hilly land, created a millennium of their history and unique culture, distinguished from those cultures of other peoples living in the Carpathians. The culture expresses itself in the unique character of the architecture, in handicrafts, traditional dress, traditions, and other manifestations of everyday life. The tragedy of Lemkovyna (the Lemko Region) began at the time of World War I, in which about two thousand Lemkos, chiefly from the intelligentsia - priests, teachers, and villagers - were arrested and interned in the "Talerhof" concentration camp near Vienna. Most of those arrested perished in the camp. The final tragedy of the Lemkos was during the Second World War and its conclusion. At the time of the German occupation, the majority of Lemko youths were taken away to forced labor in Germany. 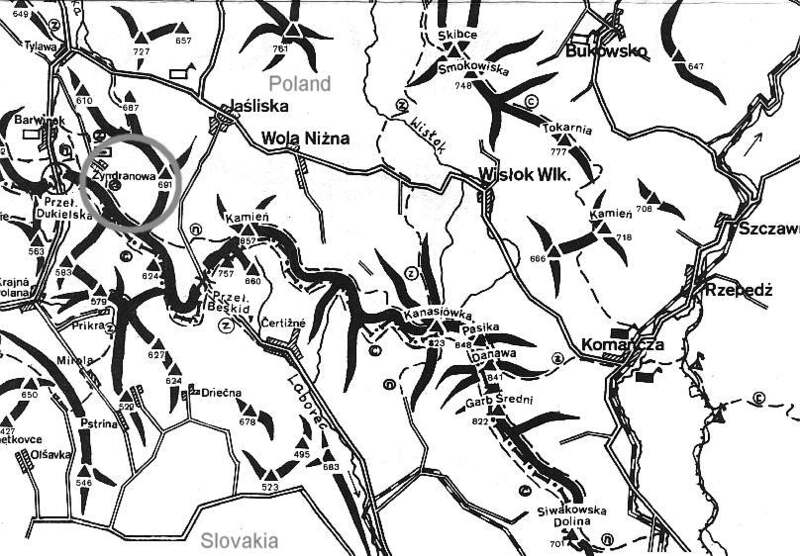 After the end of the war began the forced resettlement, in the years 1945-46, to the former Soviet Union - mainly to Ukraine; and finally in Operation "Vistula" (Akcja ‘Wisla') in 1947 to the west of Poland. Dispersed around the country and the world they never forgot from where came their roots, and now when they can finally admit to their heritage and religion, with all their effort they seek the strengthening of their identity. They seek to preserve their culture, language, traditions, and their monuments of architecture from destruction. In 1968 Fedor Gocz, with the help of Lemko cultural activists, set up in his family's old-fashioned garden a House of Memorials of Lemko Culture. Over the years many objects were collected which were tied to the history of Lemkos, while fighting against the government officials' hostility, outlasting attacks and humiliation. Eventually, thanks to fate and the persistence of Fedor Gocz and members of the Museum Council - the house was expanded so that in the end it would take on the form of a small skansen. Now the museum complex recreates a garden from the turn of the 19th-20th century, and included in the complex are: a farm house, a stable and a hen-house. In addition to this, in the middle of the exposition are found a living area, a windmill, a barn, a reconstructed old-fashioned sawmill saw, a memorial from the First World War "Talerhof", and other historical monuments. Behind the Lemko complex stands a Jewish hut and in a short time there will also be in the skansen a Gypsy artifact - a blacksmith's forge. All the listed items were repaired and restored according to the most beautiful principles of Lemko handiwork and its authentic and natural composition of placement and environment. The original supply of object is as such: tools, farm implements, old-fashioned furniture, folk crafts, clothing, and works of folk art. In one of the buildings, the stable, was arranged an exposition dedicated to the history of the First, but mostly the Second, World Wars, primarily to the battle at the Dukla Pass in the Carpathian-Dukla (Presov) Operation of 1944. Until 1991 the Museum was among the institutions supported by the Museum Council and had the temporary support of the Ministry of Culture and Art, with the District (wojewodstwo) officials of Krosno and the local officials of Dukla. Nevertheless, financial difficulties and a lack of resources have arisen in the process of establishing and development of a skansen. On April 1, 1996 the skansen entered into an arrangement placing it under the tutelage of the Regional Museum in Krosno. Suddenly with the altered status, the founding has begun of a new museum sector - beekeeping. In it are exhibits and production from a working beehive. It must be added that the Museum Association publishes the periodical "Zahoroda" and sponsors every year since June 1991 in the skansen area the folklore festival "Od Rusal' do Jana" [from Pentecost to St. John's Day], which is well-known beyond the borders of Poland, and a "Lemko Poetic Autumn Gathering." In the works is the further systematic expansion of the skansen, bringing to the grounds more and more antique objects from the territory of the Lemko Region. It's also worthwhile to emphasize that the Skansen of Lemko Culture in Zyndranova is the only one of this type established in Poland.